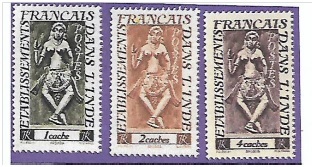 French India refers to the French Possessions in India. They include Pondicherry (now Puducherry), Karaikkal, Yanam, Mahe and Chandemagor. Largest extent of their influence was during 1741 to 1954. By 1941, the area under possession was reduced very much and the administrative capital became Pondicherry. From 1882 to 1948, numbers of stamps were issued by them. 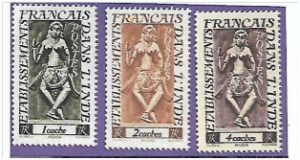 Out of these, stamps on Lord Brahma sitting on Swan, sculptures depicting God Vishnu, Dwara Balagas, other divine postures and Chidambaram temple are really nice and breadth taking. Fortunately I could collect most of their stamps. Stamp on Chidambaram Temple is scarce and very rarely available. Prices for other stamps vary from Rs 40 to Rs 500 per stamp, depending on availability. Some of the dealers sell them as a set. Stamp collectors are very much delighted and proud to own such beautiful and elegant stamps.